The photographs of Charon are part of the treasures from NASA’s New Horizons space probe, taken during the extraordinary Pluto and its moons’ July 14, 2015 flyby. The enthusiasm that accompanied the discovery of a very diverse small world concerned its largest moon as well because it also immediately showed very interesting features including the traces of violent events in its past. The Charon’s face photographed during those hectic hours has among its features a long tectonic fault system at least 1,800 kilometers (1,100 miles) long with canyons even 7,5 km (4,5 miles) deep. Those are dimensions that dwarf the Earth’s Grand Canyon! They are all the more impressive considering that this moon is big compared to Pluto but is small in absolute terms with an average diameter of just over 1,200 kilometers (almost 750 miles). A hypothesis that explains this strange Charon’s feature is the presence in the distant past of an underground ocean. Such a possibility has been repeatedly hypothesized for Pluto, somuch that someone thinks that there might still be liquid water underground. In the first phase of Charon life, water could’ve been liquid due to the heat radiated by this moon because of the tectonic activity that accompanied its formation but this couldn’t last long. One possibility is that Charon possesses radioactive elements in such an amount that the heat emitted by their decay kept at least part of the water in its liquid state for a long time after this moon’s formation. Today the water ice makes up most of Charon’s outer layer so the freezing of such a large amount of water might have caused, with its expansion, that layer to lift. One of the consequences would’ve been the surface cracking, creating canyons such as those seen today. NASA has compared this expansion to the Incredible Hulk’s transformation. 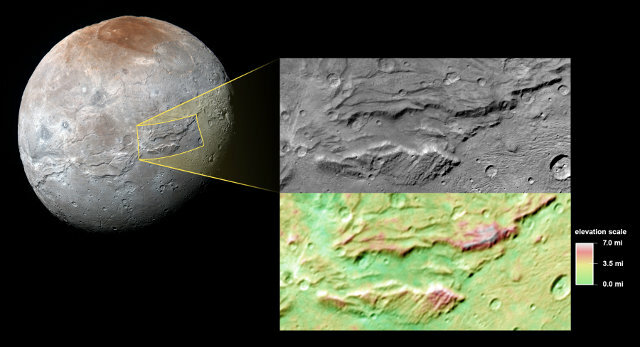 In the image, there’s a photograph of Charon’s surface and a box showing the area informally called Serenity Chasma, part of the great fracture. It was photographed by the New Horizons space probe’s LORRI (Long-Range Reconnaissance Imager) instrument from a distance of about 78,700 kilometers (about 48,900 miles). The underground ocean hypothesis was proposed soon after the arrival of the first photographs of Charon. The ones come in the following months along with other data allowed to create a topographic map of the area, shown in color in the picture. Now that hypothesis seems plausible and the investigation to construct a complete theory of what happened goes on as the New Horizons space probe will keep on transmitting the data collected for several more months.